For Vicki and Gaspar Dominguez, both Air Force veterans who served 22 years, being honored with a room full of fellow military colleagues is almost overwhelming. The Dominguez family includes Alexander, 8, a third grader at Kinder Ranch Elementary; Juliana, 11, a sixth grader at Pieper Ranch Middle School (PRMS) and Jasmin, 13, an eighth grader at PRMS who performed during with the school’s orchestra during its Friday celebration. Jileene served 21 years in the Air Force, retiring as a lieutenant colonel, and Mark served 24 years in the Air Force and retired as a colonel. Together, they have four children and have lived on 11 military bases. Finally calling San Antonio and Comal ISD home two years ago. 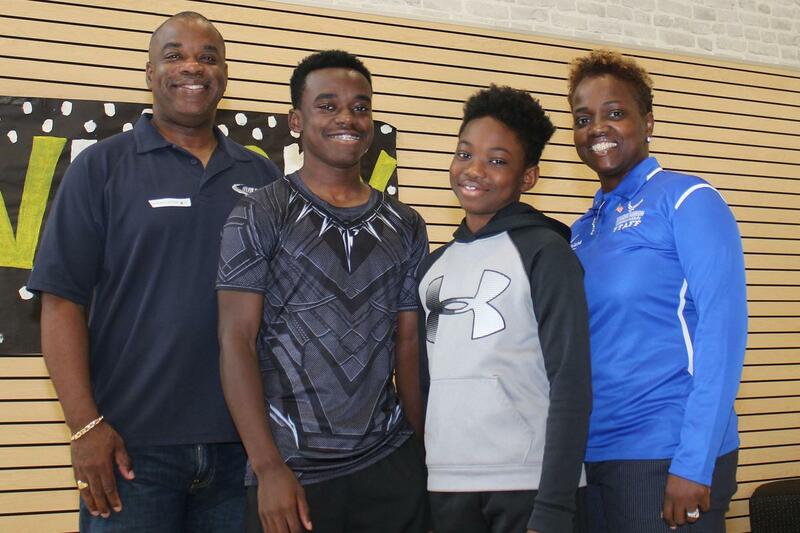 The Vivians family includes Isaiah, 13, an eighth grader at Pieper Ranch Middle School (PRMS), Christopher, 11, a sixth grader at PRMS, and Laila, 9, a fourth grader at Kinder Ranch Elementary School. PRMS seventh grader Mia Aranda gave her Aunt Victoria Saldierna a big hug when she arrived at the school’s Veterans Day celebration Friday. Saldierna woke up at 2 a.m. in Dallas in order to be at the celebration on time. She is currently serving in the Texas Army National Guard in Grand Prairie, Texas. She has completed two tours and has served for 11 years. With 25 nieces and nephews in her family, Saldierna said she would have made the trip for any of them.